Want a delicious combination of raw, crunchy veggies? This is the crunchy veggie salad for you! 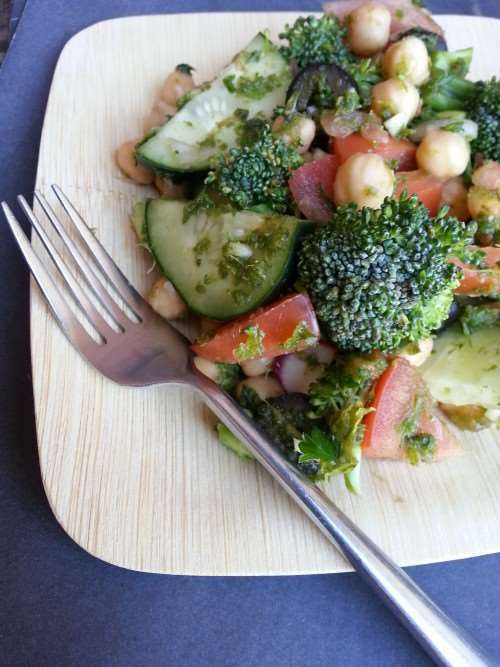 It is a tasty combination of cucumbers, broccoli, cucumbers, chickpeas, and other veggies. All of these ingredients give this Broccoli Crunch Salad recipe a unique taste and terrific texture with bite. Like most moms, I am always looking for ways in incorporate more vegetables into my family’s diet. Everyone in my family absolutely loves this salad because it includes a little of this and a little of that. We came up with the recipe a little by accident. The first time I made it, every member of the family got to choose an ingredient to include in the salad. The end result was a delicious crunchy veggie salad full of color and flavor. This Broccoli Crunch Salad recipe should be made ahead, by at least one hour. The flavor gets better the longer you allow it to set and marinate. If you want to pack it for school or work lunches, make it the night before and portion out in individual containers. If you make it the same time you’ll be serving it, just combine everything together and pop it in the fridge. Once the rest of dinner is complete, the salad with be amazing! Wow, this salad looks so awesome! Perfect idea for all the broccoli growing in my garden this year! I’d love it if you shared this post and up to two others at Farm Girl Blog Fest #21, which is live right now. You would be a great addition to the wonderful posts that are shared! Kristi, Thanks for the invitation to your Blog Fest. I stopped by with my Veggie Crunch Salad and my Real Food 101: Getting Started article. I’ll be following you via Facebook. I’d love for you to do the same.